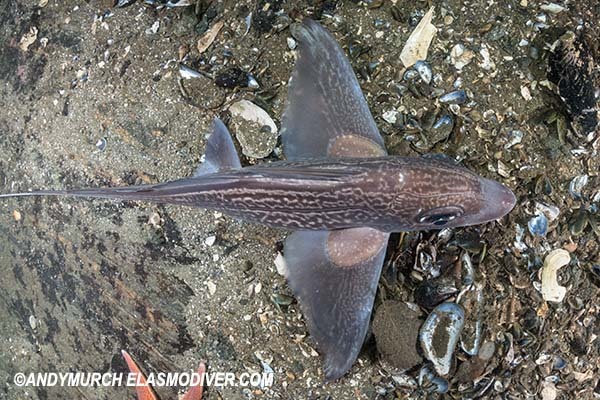 Common Names: Rabbitfish, Rabbit Fish, Ratfish, Ghostshark, Chimaera. 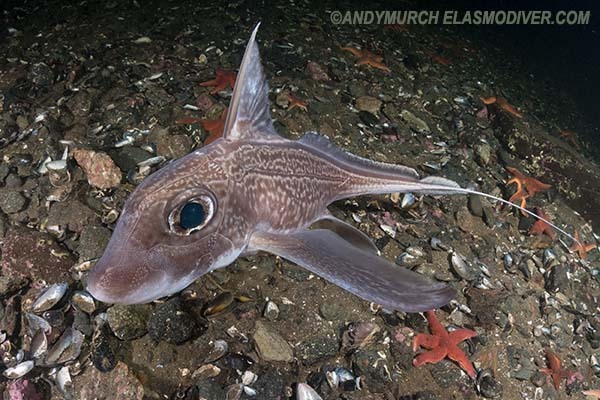 Family: Chimaeridae - short-nosed chimaeras. Identification: Head large. Body gradually tapers towards tail. Torso predominantly reddish brown with a pattern of white marbling that forms irregular lines laterally along back and flanks. A well defined lateral line is visible on flank between head and tail filament. Tail filament white. Large, black eyes may appear green in reflected light. Dorsal fin tall, with a prominent, venomous spine on leading edge. Dorsal fin has rays similar to bony fishes and can be laid flat. Second dorsal low and very long; extending from trailing edge of first dorsal to leading edge of caudal fin. Very large pectoral fins are used in locomotion i.e. flapping. Habitat: Sand and mud bottoms and sometimes rocky reefs. Listed as occurring between 40m and 1663m. However, in Trondheim Fiord it is regularly observed as shallow as 25m. Abundance and Distribution: Confined to the Northeast Atlantic Ocean and Mediterannean Sea. The rabbitfish can be found from Northern Norway and Iceland southward to Morocco and eastward to Greece. Records from South Africa are questionable. Diet and Behavior: Swims slowly across sand in search of prey. Crushes clams, crabs, and shrimp etc. in forward facing "incisors". Food located primarily by smell. Uses its pectoral fins for locomotion. 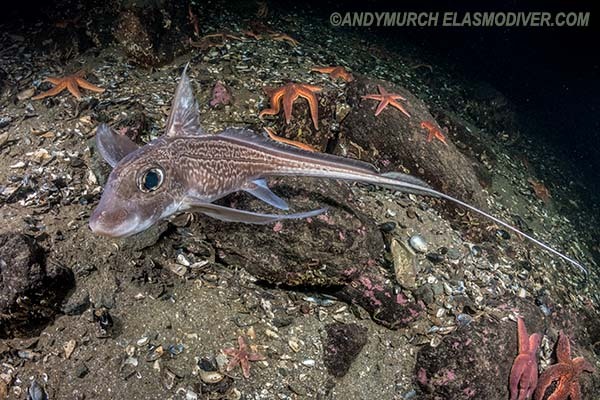 Conservation Status: The IUCN lists the spotted ratfish as NEAR THREATENED. 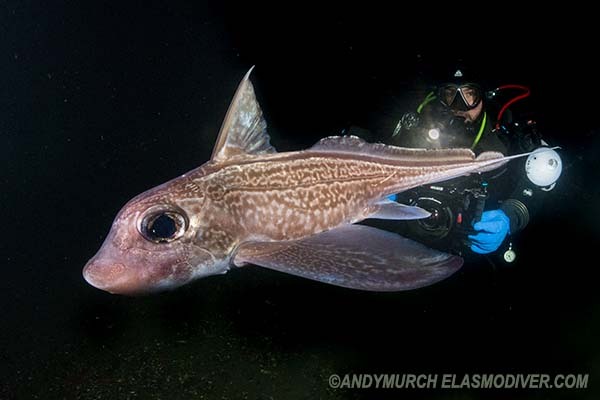 Chimaera montrosa is taken in deepwater trawl fisheries in the Northeast Atlantic and is either landed as byproduct or is a component of discarded bycatch (Crozier in prep.). In a study of discards of the French bottom trawl fleet from the South Rockall Bank to the northerly slopes of the Wyville-Thomson Ridge, C. montrosa had the largest discard biomass of all chondrichthyans (Crozier in prep.). It constitutes 13 to 15% of the discards in deepwater trawlers operating off the West Coast of Ireland (Calis et al.2005). Survival rates of discards are likely low given the depths of capture, the fact that many discards are undersized individuals or are unmarketable individuals (suggesting damage). There is increasing interest in the production of dietary supplements for human consumption derived from the liver oil of this species, and a directed fishery has the potential to develop in areas of occurrence (Calis et al. 2005). In ICES Subareas VI and VII the Argentina silus and blue ling landings from directed fisheries increased until 2002, but then declined in 2003. Bycatch species in these areas include bluemouth (Helicolenus actylopterus), greater forkbeard (Phycis blennoides), argentine (Argentina silus), deepwater cardinal fish (Epigonus telescopus), and chimaerids, of which Chimaera monstrosa is the most important (ICES 2005). Rihan et al. (2005) have also reported this species as a bycatch from bottom gillnets retrieved from 648 nets recovered during a gill net retrieval survey of Rockall and Porcupine Bank at depths of 400 to 1,300 m during August-September 2005. Evidence of significant quantities of lost and abandoned gear in these areas and of excessive discarding in these fisheries due to long soak times lead to serious concerns about the impact of ghost fishing. There is a need for the immediate introduction of effective management measures in these fisheries to control the quantities of gear being fished and soak time (Rihan et al. 2005). Areas of the Northeast Atlantic, for example the Rockall Trough have been subject to a fairly rapid increase in deepwater fishing activities since the 1990s with overall concern for the sustainability of deepwater fish stocks (Gordon 2003). There is a continuing trend of increasing deepwater fishing activities in the North Atlantic, while regulation is often lagging. Deepwater chimaeroids, like other deepsea chondrichthyans, are potentially at risk from these activities, although little species-specific information is available. 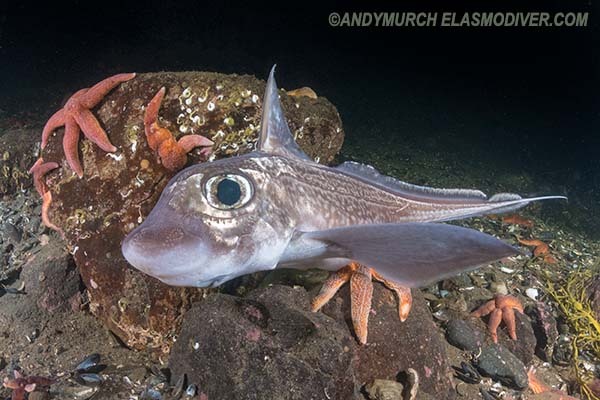 Monitoring of deepwater fishing activities, including landings and discards will be essential to ensure that North Atlantic chimaeroid species are not adversely affected. Crozier (in prep.) has shown that high catches of C. montrosa occur between the Rockall Bank to the Wyville-Thomson Ridge, and this likely mirrors catches elsewhere. 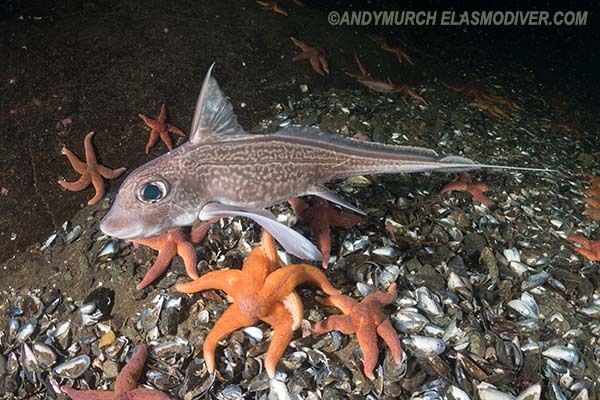 Further information is required on deepwater fishing activities (including catch and bycatch levels, effort and trend monitoring) in the North Atlantic and the conservation status of this species should be reassessed without delay when such information is available. Both present and future fishing pressure may be shown to be unsustainable for C. montrosa, particularly given its preferred depth range. Similar species: The Rabbitfish shares its range with a few other chimaeras but none within the genus Chimaera. The Small-eyed Rabbitfish (Hydrolagus affinis) has smaller eyes, a smaller first dorsal fin and no obvious markings. The Large-eyed Rabbitfish (Hydrolagus mirabilis) is also unmarked. The Pale Rabbitfish (Hydrolagus pallidus) has off-white skin with no obvious patterning. Reaction to divers: Slowly moves away it can be easily followed at close range with non-threatening movements. Diving logistics: In Trondheim Fiord, Rabbitfish come into water as shallow as 20m near muscle farms. 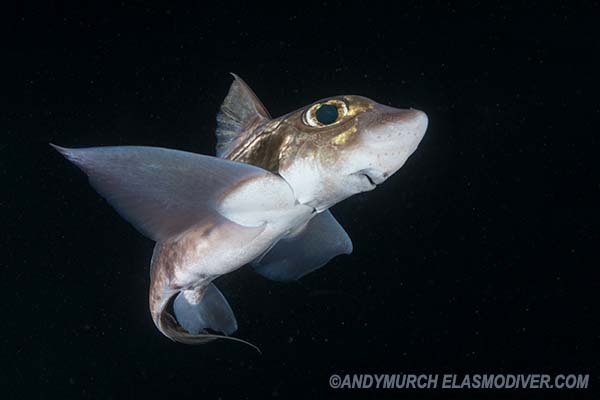 Big Fish Expeditions runs a Deepwater Shark Diving Expedition every year that usually encounters Rabbit Fish and numerous other cartilaginous species. Dagit,D.D., Hareide, N. & Clò, S. 2007. 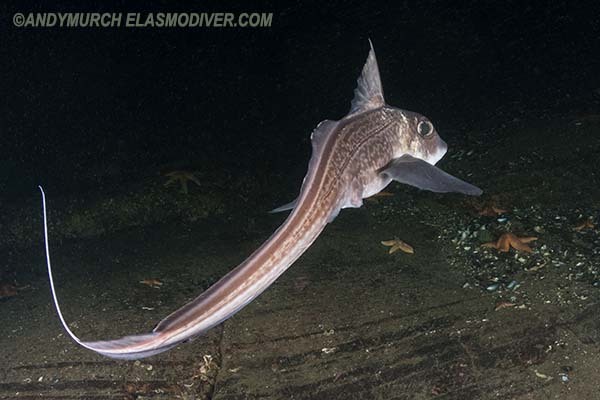 Chimaera monstrosa. The IUCN Red List of Threatened Species 2007: e.T63114A12610445. http://dx.doi.org/10.2305/IUCN.UK.2007.RLTS.T63114A12610445.en. Downloaded on 15 December 2018.